Tootsie made a big impression on me as a child. Jessica Lange was clearly the most beautiful woman on the planet, the ending was heartbreaking but I couldn't completely understand why, and the Russian Tea Room was a hushed, sophisticated temple filled with important people eating lunch. 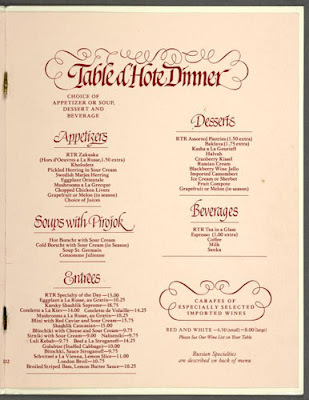 The Russia Tea Room opened in 1927 at 150 West 57th Street as a meeting spot for Russian émigré artists and dancers. It really was Russian and it really served tea. Sidney Kaye bought the space in 1955 and expanded the tea room to a larger restaurant. After Kaye's death in 1967, his widow Faith Stewart-Gordon took it over. 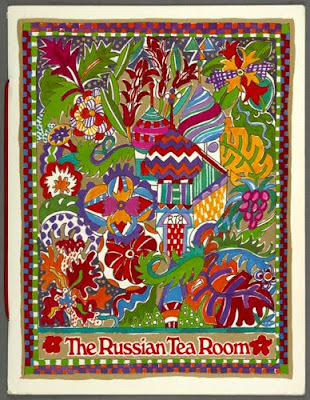 She wrote The Russian Tea Room Cookbook, The Russian Tea Room: A Tasting, and The Russian Tea Room: A Love Story. Warner LeRoy bought it from Stewart-Gordon in 1996 and spent millions renovating the restaurant. 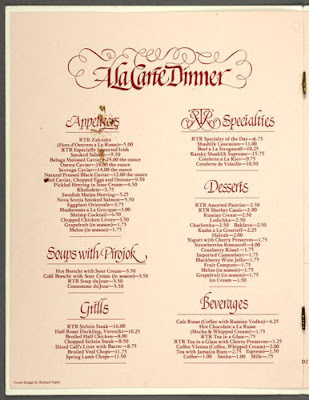 As William Grimes writes in his page-turning book on New York restaurant culture Appetite City, "LeRoy was convinced that he was giving New York a splendid gift, a giant Fabergé egg that would make diners fall in love with the Russian Tea Room all over again." Grimes himself wasn't smitten with the results. In his New York Times review after the re-opening, in 1999 — in which he awarded the restaurant a "satisfactory" — Grimes writes, "It takes a little while to gauge the full dimensions of the disaster." The restaurant, sadly, never reclaimed the glory it once had. But that does not take away from the wonder so many of us have of this icon on 57th Street. I love that scene from "Tootsie" and thanks for a peek at the old menus! Rebecca, what is your email address? I am a student at Pratt and would like to know what you are teaching in the Fall semester. I see you on the list.